Illuminate your home or special event with these attractive unscented white floating disc candles by Royal Imports. 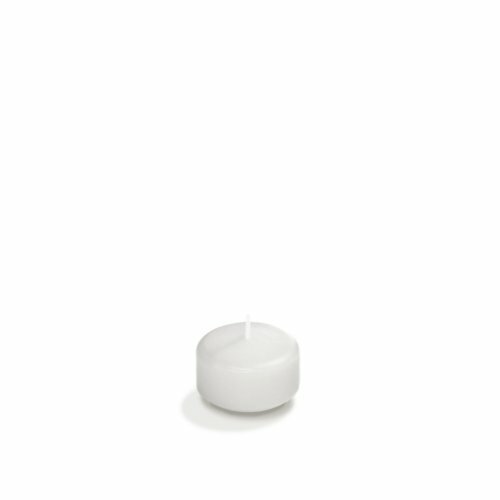 These 2" disk shape candles are crafted with high quality white wax and cotton wick. The combination of these two elements will ultimately result in a clean and smokeless burn. The wax used in this floating candle is of the highest caliber and is made the USA. It is guaranteed not to drip or melt away fast. The average burn time is 4 hours which outperforms most mini floating candles. The extended burn time allows you to re-use this candle for multiple events thus adding value to your product. The special quality wax which is used in this candle is uniquely light-weight which helps the candle stay afloat. Place it in a bowl of water, swimming pool, or water-filled vase to create an attractive addition to any occasion including, wedding reception, garden, spa, bedroom, etc. Royal Imports brings the highest quality candles and candle holders to the floral and event industry. Each 2 inch candle is crafted to perfection thus creating a sleek, flawless accent. 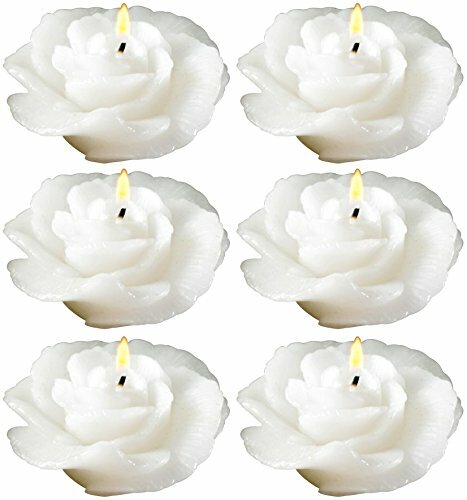 Packaged 6 floating candles per pack. QUALITY & SAFETY: Each 2" floating candle is crafted of the highest quality wax to enhance its appearance and prevent it from dripping or melting away fast. All Royal Imports floating candles are MADE IN USA, and feature cotton core wicks which causes the candles to burn clean and smoke-free. BEST SELLER: These beautiful disc candles are best sellers in the floral supply, home d cor, and wedding planning industry. From home decorators, to event planners, a high quality traditional floating candle is always put to good use. It will enhance any event with its warm light and bring upon a sense of harmony and romance. USES: These attractive floating disks are commonly used as: party favors, emergency light for power outages, aromatherapy, outdoor patio ambience, restaurant tables etc. Because of its extended burn-time, Royal Imports candles can be re-used numerous times. 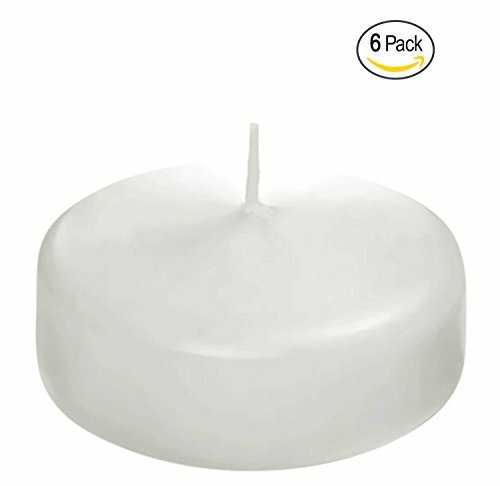 PACKAGING: Pack of 6 candles - carefully wrapped to prevent damage. When it comes to our customers satisfaction, we have one rule: settle for nothing but the best. That s why we work only with premium quality products and manufacturers that are guaranteed to deliver to our high expectations. Because you want to achieve a much beautiful ambience than the one delivered by traditional candles. Your guests will always comment on how pretty they look. Our white floating candles are everything you were looking for and they fit your needs wonderfully! An awesome product indeed! The design of this product is specially made for you to float these white candles in every jar since they fit perfectly. Just decorate the bowls or jars and you will get the perfect image. 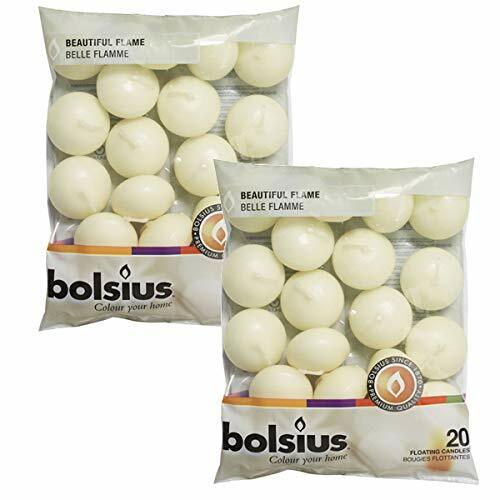 This Bolsius set includes 20 candles which have 13/4 inches and will definitely make your party a great one! 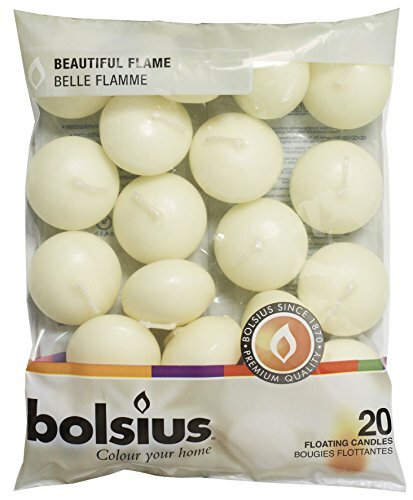 Premium quality materials: natural wax and the best wick Multipurpose Nice floating 4-5 hours burn Smokeless Unscented Pretty flame Beautiful design Size: 13/4 inches; color: white ADD TO CART NOW and enjoy the elegance and beauty of this Bolsius Set of White Unscented Floating Candles! WHAT YOU NEED: Are you tired of using regular candles to your party? Would you like to try a different product to achieve a better result? If your festive events need a touch of light and elegance we offer the solution. PREMIUM QUALITY MATERIALS: These Bolsius floating candles are made of the best wax and wick so that you can enjoy them for a longer time. Put them in a vase full of water or in any other body of water and they will float wonderfully. Once the candles are lit they will provide the desired effect. MULTIPURPOSE: This product we strongly recommend is the best alternative to ordinary candles. They can be used on special occasions and holidays such as: engagement or wedding receptions, dinner parties, garden or beach parties. These white unscented candles will definitely be the centerpieces of your beautiful event. FLOATING DECORATION: You can set up various different clear glass vases and arrange them in the center of the table. Decorate each vase with a flower at the bottom and some colored stones all around them. Then fill the vases with water and float the candles. It will be a great ambience! CLEAN BURNING AND EVEN FLAME: Our product is crafted to burn for 4-5 hours. You will not need to worry about smoke since these unscented candles burn cleanly with a nice and smooth flame which will stay bright the whole time. They look lovely and your guests will surely exclaim over this elegant centerpiece. The design of this product is specially made for you to float these white candles in every jar since they fit perfectly. Just decorate the bowls or jars and you will get the perfect image. This Bolsius set includes 40 candles which have 13/4 inches and will definitely make your party a great one! These beautiful disc candles are essential in the floral supply, home decor, for home decorators, interior design to event planners, this high quality candle is always put to good use. Used in floral arrangements, basic floral design, as tealight candles and the wedding planning industry. Perfect in restrooms as window candles, as memorial candles, catholic candles, or a baptism candle, the arts and crafts ideas and even as religious candles. Essential for a baby shower decorations for girl, baby shower favors, wedding centerpiece candles, and much more! Add a special touch to your next dinner party by placing floating candles for varied centerpieces or create a beautiful design by grouping pillar candles along side these natural floating candles. NOTICE: The "Super Z Outlet" seller is the only authorized seller, we do not sell wholesale so there should be NO other sellers; Any other sellers are illegally selling their own products using our registered Trademarked company name. In this listing, purchasing from any seller other than "Super Z Outlet" will result in a potentially faulty product that may be unsafe and cause injury. Please be sure to purchase this product from the "Super Z Outlet" seller to avoid any problems with your product and to ensure both your safety and satisfaction. Manufacturer's warranty included only when purchased from Super Z Outlet. From home decorators, to event planners, a high quality traditional floating candle is always put to good use. Smooth great looking natural colored candle. Disc shaped to float in water. Widley applied to Birthdays, Christmas decorations, home decorations, baby shower centerpieces, and hotel spa candles. Burn time is approximately 4 hours and disc shape for efficient burning, you can make sure these candles will hold up through the duration of your event. 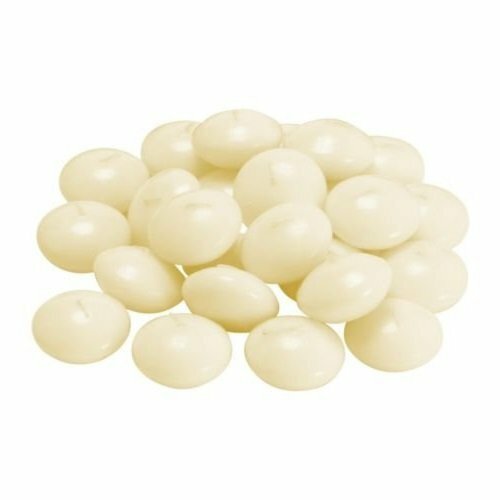 Add a warmth of romance by placing these ivory candle discs around your hot tub when taking a relaxing bubble bath. Frequently used as wedding candles, party favors, emergency light for power outages, aromatherapy, art and crafts, and romantic candles for that outdoor patio ambience. Place it in a bowl of water, swimming pool, or water-filled vase. Because of its extended burn-time, candles can be re-used numerous times. Burns approximately 4 hours. Candles are made of paraffin/vegetable wax. With its clean dripless and smokeless wax feature, these unscented candles are ideal for special occasions. Includes with a safe lead-free cotton wick. Candles measure 1 3/4 inches in diameter and 3/8 inches in thickness. Includes 24 natural color candles per order. Floating candles are popular and inexpensive for decorating throughout your home, wedding receptions and special events. Available in three round candle sizes: 3 inch floating candle, 2.25 inch floating candle or 1.75 inch floating candle are available in 45 beautiful candle colors. They are very versatile for mixing and matching colors and sizes for your centerpiece arrangment. Add a little warmth and cozy candlelight glow to any table centerpiece by displaying colorful floating candles in floating candle holders or pillar holders for any occasion. 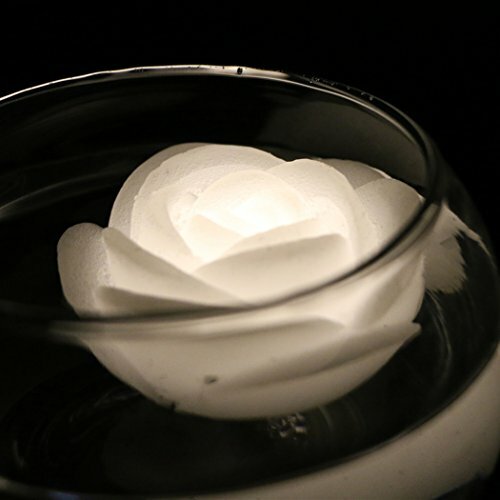 White Rose Floating Candles are great for Weddings! Biedermann & Sons has specialized in unique candles and decorative accessories since 1956. The highest quality and craftsmanship define our selection and we are proud of our quality and selection. 1. LED floating candles can go almost any where your decor and event lighting. Place it in a case to high light the base of a beautiful floral arrangement. 2. 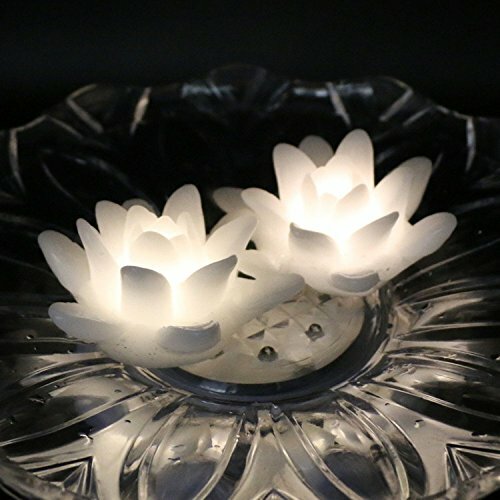 The LED floating candle are waterproof and wireless, they are perfect for lighting up vases, bowls, or any water filled containers. Also can safe to use in bathwater while taking a bath. 3. Battery-powered LED floating candle light are fun, safe and perfect when you need an alternative for candles decoration in order to meet fire codes or to avoid the dangers of an open flame light. 4. Can support multiple uses; Waterproof and durable, Uses button batteries (included); Each product contains 1 x CR2032 battery can be replaced! Batteries are included and will last approximately 24 hours; Each product contains 1 x CR2032 battery and can be replaced!